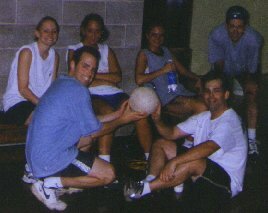 The Team: Cal, Keith, Paul, Kellie K., Cindy T., and Kelly W.
The Team: Cal, Brad, Emily, Schlatter, Patty, and Kim F.
Summer of 1999 Volley's team, "Junior's Grades" went 18-6 and was champion runner up. The Summer of 2000 Volley's records. First session team "Shake the man loose" finished 17-7, second place. Second session team "Shake and bake" finished 18 - 6, tied for second. The Team: Cal, Brad, Kim C., Gina, Holly, and Cindy F.
Final Record: 14 - 11, fifth place of eight teams. The Summer of 2001 Volley's records. First session team "Still Standing" finished 18-6, champion runner up. Second session team "Alaskan Anchors" went 20-4 and was the rec league champions. I don't f---ing believe it. 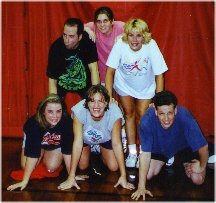 The team: Cal, Kim C., Gina, Leeann, Holly, Tom H. and subs. The Team: Cal, Brad, Kim C., Gina, Holly, and Scott S.
The Team: Cal, Brad, Kim C., Gina, Holly, and Leeann. The Summer of 2002 Volley's records. First session team "Stone Gina" went 10-11. Second session team "Blue It" went 18-6 and got 3rd place. The Team: Cal, Brad, Gina, Holly, Darren, and Katie. The Team: Cal, Brad, Gina, Holly, Katie, and Phil. The Summer of 2003 Volley's records. First session team "Perfect Season" finished 3rd at 18 - 6. Second session team "Not Too Late" finished 3rd at 15 - 9. The Summer of 2004 Volley's records. First session team "You're Fired" finished second place at 17 - 7. Second session team "Odd Couple" finished 12 - 12, place unknown. The Team: Cal, Brad, Gina, Katie, Phil, and Patti. The Team: Cal, Brad, Gina, Patti, Joe, and subs. The Summer of 2005 Volley's records. First session team "Off Too Much" finished third place at 14 - 10. Second session team "Worm Girls" finished 15 - 9. The Team: Cal, Brad, Gina, Patti, Phil, and subs. The Summer of 2006 outdoor records. First session (Volleys) team "" finished third place at ?. Second session (Cabo) team "Lost Motivation" finished 15 - 6. The Team: Cal, Brad, Gina, Phil, Angy, Callie, and subs. Final Record: 7-17, last place or close to it. The Team: Cal, Brad, Gina, Phil, Callie, and subs. Final Record: 9-12, place - near the bottom. The Team: Cal, Brad, Gina, Joe, Angie, and subs. Final Record: 19-8. Third place outta 11 teams. Summer of 2007 Volleys outdoor records. First session team "Get It In" finished second place at 18 - 6. Second session team "Wildfire" finished fourth with 13 - 11. The Team: Cal, Brad, Gina, Phil, Rachel M., and subs. The Team: Cal, Brad, Gina, Rachel M., and subs. The Summer of 2008 Volleys outdoor sand VB records. First session team "Air Maile" finished 12-12. Second session team "Quitten Time" finished 10-14, fifth place. Third session team "Dude!" is 11-7. The Team: Cal, Brad, Gina, Phil, Rachel M. and subs. Final Record: 4-20, dead last, ouch. The Team: Cal, Brad, Gina, Phil, Rachel M. and Beth B. Final Record: 3-15, worst season ever. The Summer of 2009 Volleys outdoor sand VB records. First session team "PH Good Day" finished 16-8 and second place. Missed the sign up deadlines for other sessions. The Team: Cal, Brad, Gina, Phil, Rachel M. and Karol K.
The Team: Cal, Brad, Gina, Phil, Rachel M. and Anna S.
Final Record: 10-14, 10th place out of 13 teams. The Summer of 2010 Volleys outdoor sand VB records. First session team "LOST" finished 14-10, fourth place. Second session team "Double AA Women" finished 20-4 as Rec League champions. The Team: Cal, Brad, Gina, Phil, subs. Final Record: 5-16, dead last. The Team: Cal, Brad, Gina, Phil, Hannah, Allyssa, and subs. The Team: Cal, Brad, Gina, Phil, Allyssa, and subs. The Summer of 2011 Volleys outdoor sand VB records. First session team "Godzilla" finished 15-9, fourth place. Second session team "Full Nine Yards" finished 16-8, second place. The Team: Cal, Brad, Gina, and subs. The Summer of 2012 Volleys outdoor sand VB records. Second session team "Fours Sucked" finished in the middle of the pack. I missed the sign-up date for Fall 2012 YMCA. The Team: Cal, Brad, Gina, Beth, Brittany, Josh. The Team: Cal, Brad, Gina, Beth, Josh, Ellen B. The Summer of 2013 Volleys outdoor sand VB records. The Team: Cal, Brad, Gina, Rachel, Nikki, Maddy. The Team: Cal, Brad, Gina, Rachel, subs: Liz B. The Summer of 2014 Volleys outdoor sand VB records. The Summer of 2015 Volleys outdoor sand VB records. Third session team "Antmen" finished ? The Team: Cal, Brad, Gina, Phil, Beth, Karol. The Summer of 2016 Volleys outdoor sand VB records. The Team: Cal, Brad, Gina, Karol, Carrie A., Josh, Phil, subs. 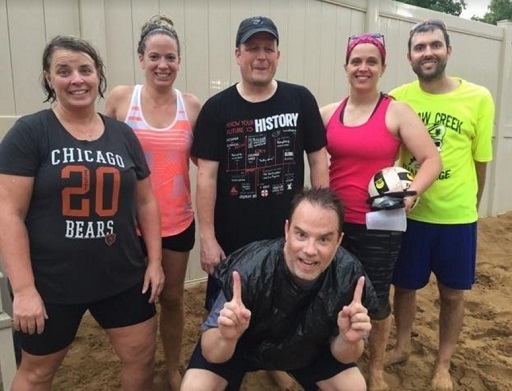 The Team: Cal, Brad, Gina, Karol, Johanna, Chris P.
The Summer of 2017 Volleys outdoor sand VB records. 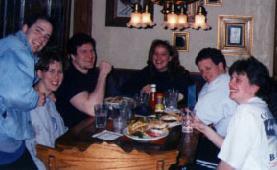 The Team: Cal, Brad, Gina, Beth, Carrie A., Erich. The Team: Cal, Brad, Gina, Jo, Carrie A., Erich. The Summer of 2018 Volleys outdoor sand VB records. The Team: Cal, Gina, Beth, Rachel, Bri, subs. The Team: Cal, Gina, Beth, Rachel, Adam, Jeremy. Some Wet Sand, and Go Indians. There is a story behind each name, read about them here. Cal is known for going months, if not years, without a bad serve. Cal went three YMCA sessions in a row 2008-2009 without a bad serve.